The study [click for abstract] was published online in Environmental Health Perspectives on July 20, 2012. Environmental Health Perspectives is a publication of the United States National Institutes of Health’s National Institute of Environmental Health Sciences. The average loss in IQ was reported as a standardized weighted mean difference of 0.45, which would be approximately equivalent to seven IQ points for commonly used IQ scores with a standard deviation of 15. Some studies suggested that even slightly increased fluoride exposure could be toxic to the brain. Thus, children in high-fluoride areas had significantly lower IQ scores than those who lived in low-fluoride areas. 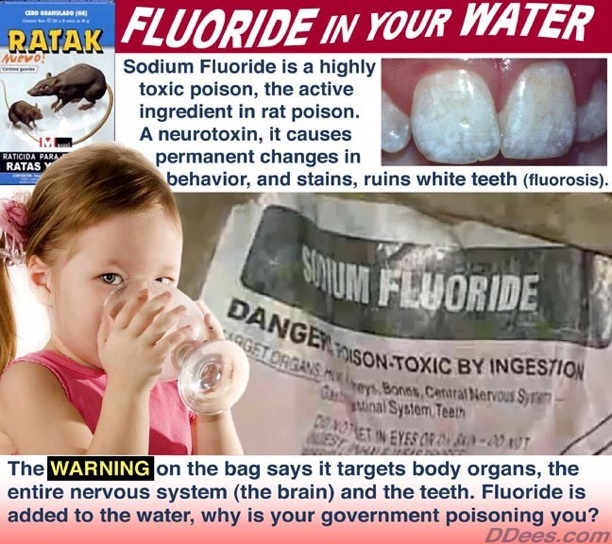 Fluoridating the public water supply by the private government is yet another example of another obvious tactic of war declared by the bogus government against ALL OF US without our consent. Psychos who believe they can quarantine themselves from its all pervasive effects. They must eat organic - and have nothing that's processed or cooked in town water! No conspiracy necessary though - this is simply the cheapest way of disposing of industrial waste that can't be legally made to disappear in any other way - just like 'depleted uranium' (nuclear waste). Simply business as usual. Trun on. Tune in. But above all, OPT OUT and don't work in any job that isn't actively healing the planet! Was There An Explosion in the Great Pyramid?